Snowflakes are very popular Christmas symbols, especially in the United States and Europe, where people will most likely have a traditional White Christmas. The beautiful origami snowflakes in the picture above were designed by Toshikazu Kawasaki. The diagrams are available in his book Greatest Dream Origami (ISBN 9784255005058). 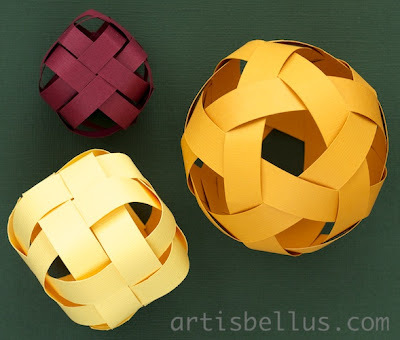 I like them because they are three dimensional and quite easy to fold. My favorite is the one at the bottom right of the picture, that looks almost like a flower. I would recommend to use very thin paper. I folded the snowflakes with hexagons cut from 9" (225 mm) squares of Pacon Paper Squares and 6"(150 mm) squares of Thin Crisp Washi Paper. 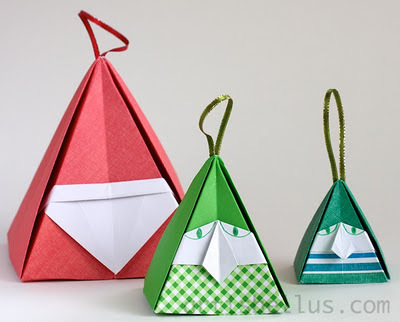 Origami ornaments are nice and inexpensive decorations, suitable for any occasion. You can chose the appropriate colors depending on the specific holiday. You can also paint them and add glitter, ribbons or beads to make them unique. 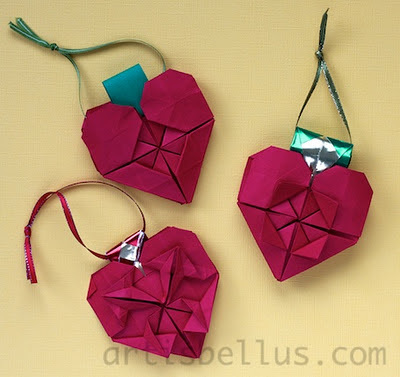 For hanging decorations, it is important to select models that look nice from both sides, like these Heart Ornaments that will beautifully decorate your Christmas tree. I folded the Heart Modules in the video with 6" (150 mm) red Tant paper, and the connector with a 2"x 4 ½" (50 x 113 mm) rectangle of green Tant paper. For the Heart Ornaments in the picture above, I used different decoration folds on the hearts than in the video. I also used some bicolor connectors, folded with foil paper. 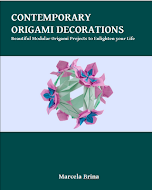 You can find more ideas for the connectors in my book Contemporary Origami Decorations . The book also contains instructions to fold a lot of modulars that will make attractive and unique Christmas tree decorations. Please remember to add the book to your Christmas shopping list! Are you looking out for a centerpiece to decorate the Thanksgiving table? Why not arranging some rich red, bold orange and bright yellow origami flowers in a cornucopia basket? The cornucopia is a symbol of plenty, particularly associated in North America with the Thanksgiving holiday. Iris, traditional model, diagrams available in several books, like Complete Origami. Gerbera, spray mum, and lily bud, created by Hiromi Hayashi, from the book Origami Flowers . Octagonal flower, created by Paul Jackson, from the book Complete Origami Course . 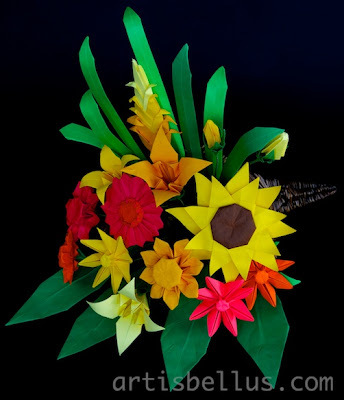 Sunflower, created by Yoshihide Momotani, from the book Lay Out a Garden with Origami, ISBN 441630404. Leaf, created by Michael Laffose, from the book Origami Art . Wheat spike, created by Tomoko Fuse, from the book 12 Months in a Small Box - Spring/Summer, ISBN 4480873392. Browsing through my books I came across Extreme Origami , by Kunihiko Kasahara. This is a very interesting book and a source of inspiration. 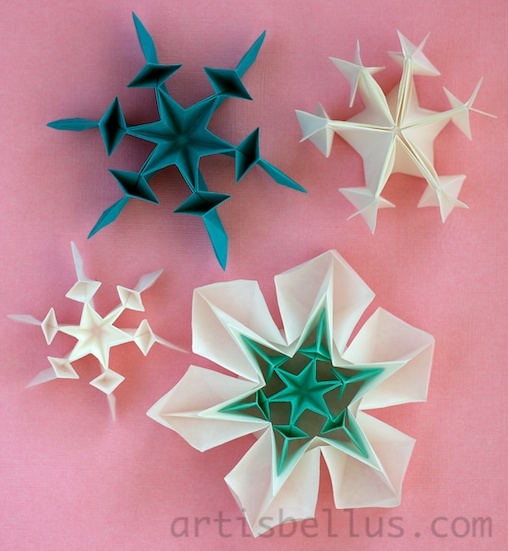 The author encourages the reader to "free (himself) from the traditional rules of classical origami" by experimenting using different shapes, materials, techniques and even allowing some cutting, painting and gluing. Binding, pleating and weaving are some of the techniques described in the book. The cubes (top and bottom left) and the greek soccer ball (right) in the picture below are some of the models from the book. They were made from plaited card stock strips.